There are many dance organizations in New England and around the country that will be happy to provide you with information on dancing in their area. Some of them might also host swing dances and classes. Below you'll find information for Boston, Massachusetts, and New England. On a separate page, you'll be able to find information for the individual non-New England states. There is information available for Canada and various US national organizations. If you believe your organization should be listed here or if you have corrections for any listings here, please write to dancenet@havetodance.com". If you hold dances on a regular basis, you should (also) probably be listed on the pages for dancing in Boston, in New England, or on the individual state pages. Don't forget to read the list of Frequently Asked Questions before sending your information in. Boston's Gay/Lesbian/Bisexual Swing and Ballroom Dance Group. 617-364-7207. Massachusetts chapter of the US Amateur Ballroom Dancers Association. 1/11/12: Website hasn't been updated in 10 years. The Cape and Island Chapter of the US Amateur Ballroom Dancers Association (now USA Dance). For more information, contact CCBDPresident@gmail.com. Social ballroom dancing in Pittsfield once a month. Social ballroom dancing club that holds dances south of Boston. Monthly dances and weekly practices. For more information, contact South Shore Dancers at P.O. Box 276, Norwell, MA 02061 or call Tom Osterland at 781-659-4703.
southeastern Connecticut. Live band dances on the third Saturday of the month. Listings of swing and lindy hop dancing events, teachers, and music in Connecticut and the Northeast. Focuses mostly on Ballroom and not associated with this website. Rhode Island Chapter of the US Amateur Ballroom Dancers Association. Amateur Ballroom Dancer Association serving Greater Hartford, Connecticut. New London (close to the Rhode Island border). For more information, contact swing@brown.edu. For more information, contact unhhepcatsswing@gmail.com. Monthly dances on the 2nd Sunday of the month at Dartmouth College, Hanover. For more information, contact club president Sean Gao at 281-725-2062. Brown University Ballroom Dance Club & Team. Tracks swing dance competitors to manage the levels of competitions that dancers enter. For more information, contact Annie Hirsch. Soon to be formerly known as the US Amateur Ballroom Dancers Association. For information, contact usabdacent@aol.com. 1412 4th Street SW, Washington, DC 20024. Phone: 202-479-1080, Fax: 202-479-1081. For more information, write to nbea@oneota.net. offers a national competition circuit for all styles of swing for novice and intermediate swing level dancers. The American Bop Associations is a non-profit corporation formed to promote and preserve the dance styles and music of those dances known as Bop, Swing, Shag, and Jitterbug. For information, contact cincibop@sprynet.com. 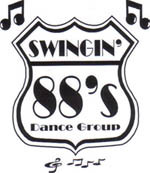 Group of affiliated members dedicated to the promotion and preservation of dance styles known as Bop, Shag, East and West Coast Swing, DC Hand Dance, Push, Whip, Lindy and Jitterbug. For more information, write to Bill Maddox.